B U B B L E G A R M: Bourjois + Illamasqua blogger events! 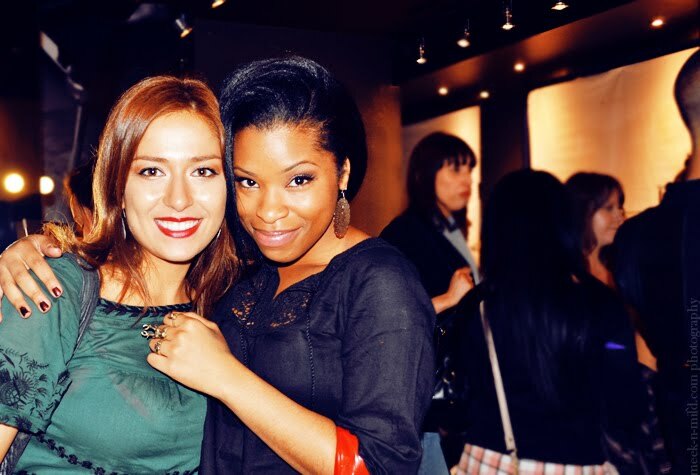 Bourjois + Illamasqua blogger events! Bourjois have launched a new foundation and roller ball concealer (I can't keep up!) called 'Bio Detox Organic'. I used it last night and was pretty pleased, it offers great coverage (I didn't need concealer) yet still manages to feel light and look natural on the skin giving a semi matte finish. I will do a full review on it at a later date. They have also launched another mascara called the "Volumizer" which has a 2 step system, I also used this yesterday and I personally didn't like it - it doesn't beat my L'oreal Voluminous! 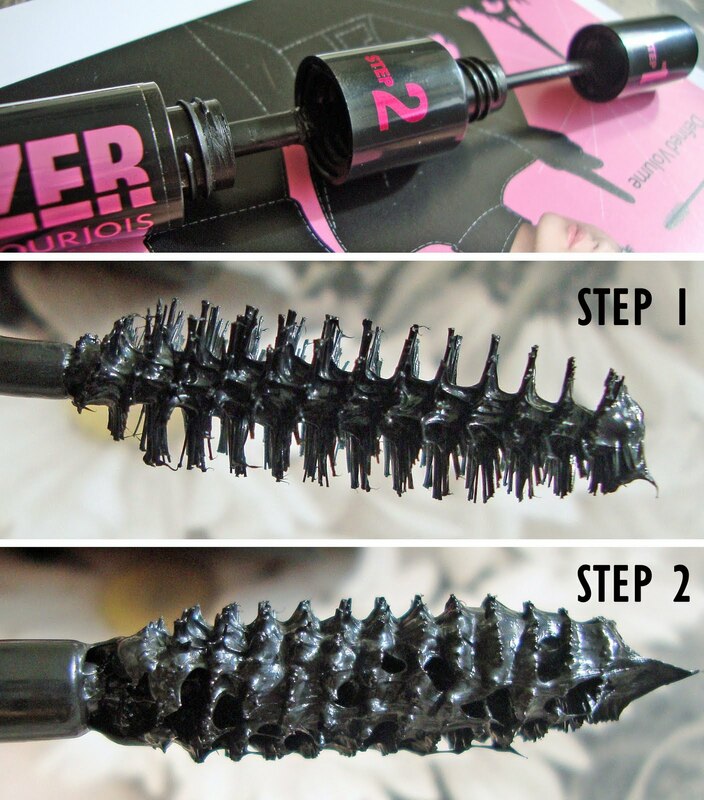 Step 1 doesn't give enough volume, and step 2 gives too much making my lashes stick together. But bravo for the innovative technology. The Bourjois eye shadows are hit and miss with me. The new trio (09 Lady vert de gris) looks like it would be a great handbag product but fails due to the lack of pigmentation. There's also a new blush for Autumn, called "Tomette D'or", It's a warm terracotta shade with tiny flecks of gold glitter. 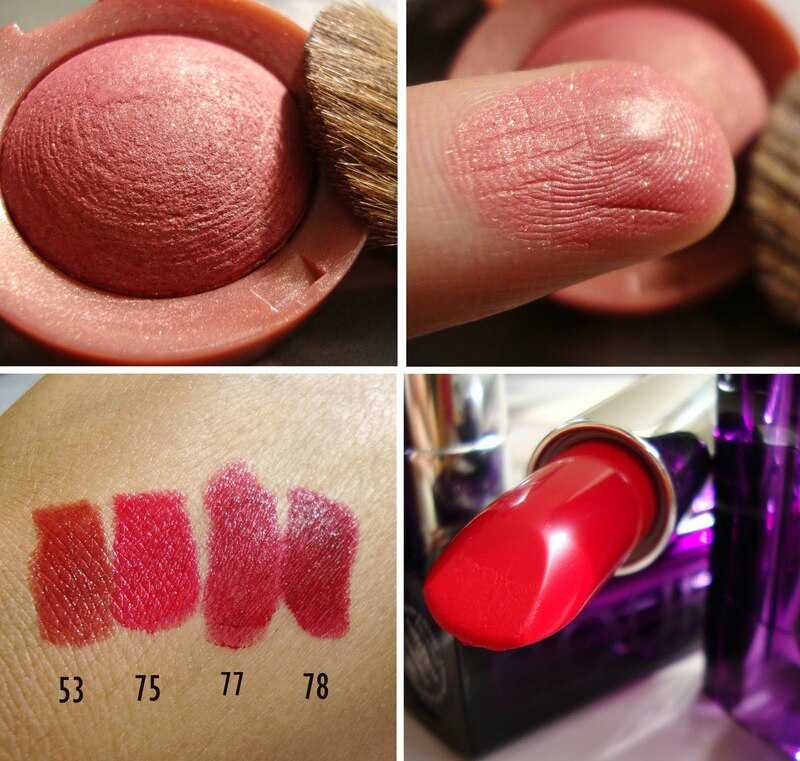 The baked blushes are beautifully pigmented, however this isn't a shade I'm crazy about. Bourjois have also launched some new red lipsticks, I had Bourjois makeup artist Cassie Lomas apply the darkest shade (78) on me which you will see a picture of at the end. 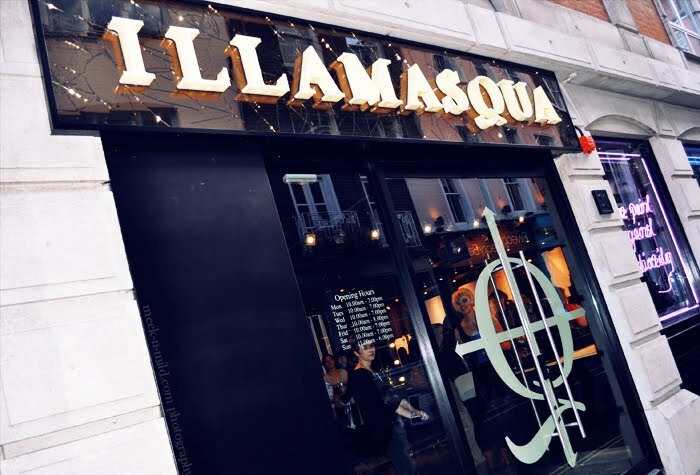 I then waltzed to the Illamasqua event which was held at their debut flagship store for a bloggers preview of the 'ART OF DARKNESS COLLECTION'. I came away with the Powdered Metal in Ether which is a very finely milled gold loose powder with golden flecks. Here's a couple of swatches on the skin, it can be used as a face and body highlighter, it gives the most beautiful golden sheen which looks very ethereal albeit fake. The nail varnish shade I have is "Viridian" a dark metallic green. I happened to be wearing Barry M's (299) Racing green which looks incredibly similar. On close examination Viridian looks like it has more blue in it. However when swatched they both look almost identical, 'Racing green' is a fraction glossier than 'Viridian'. Are you wanting anything from the new releases? Disclaimer: All products mentioned were provided for review purposes, I am not paid to blog about them and I am not affiliated with the brands - This is clearly my honest opinion as always. I really want to try this new foundation from Bourjois!!! I've been a loyal customer of the brand a few years ago so I might switch to Bourjois again. I do love Bourjois... the packaging is always spot on. such a great review! I think i need that illamsqua metal powder...its looks so pretty! where can you purchase bourjois in the states?! Racing Green looks gorgeous in these pics. I always think the Bourjois colours look great on the shelf but not particularly striking once applied. you should definitely wear red lips more often, i think you wear it beautifully. especially that deeper shade! i saw another review on the volumizer and i have to say, it was disappointing. clumps-galore! the powdered metal looks absolutely diving, perfect for the dead of winter when my skin's a bit sallow :p. i definitely would love one of these! 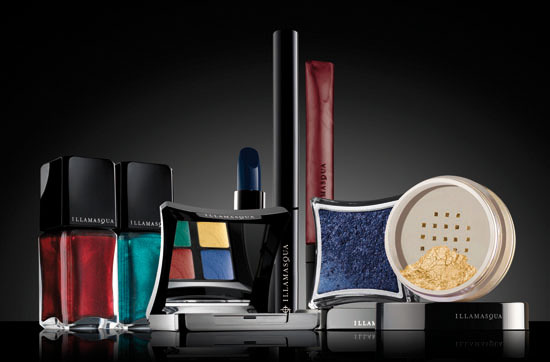 That Illamasqua collection is gorgeous! Love the new Illamasqua collection. Racing green looks gorgeous by Barry M. Too bad we do not carry that here in the US. Hey i've been following your blog and I thought I'd let you know that I'm having a MAC and Juicy Couture giveaway on my blog...check it out if you like! The foundation sounds very interesting. I love the nail polishes from this Illamasqua collection too. I know you say the red lipstick is outside of your comfort zone but I think you pull it off very well! Thanks for the reviews. I added 'Viridian' to my next shopping list. Great post. I love that Illamasqua illuminator! And I actually prefer the finish on the Barry M polish weirdly - it's quite similar to the Models Own Beetlejuice polishes, which I have stocked up on. They're amaazing. Study and distinct manufacturer certain hassle codes. though many others are not.